During this afternoon's Kentucky-Louisville tilt, CBS cut away for a moment to show a clip, from November 29, of senior Kentucky Senator and Senate Minority Leader Mitch McConnell giving a speech on the Senate floor praising Louisville athletic director Tom Jurich. 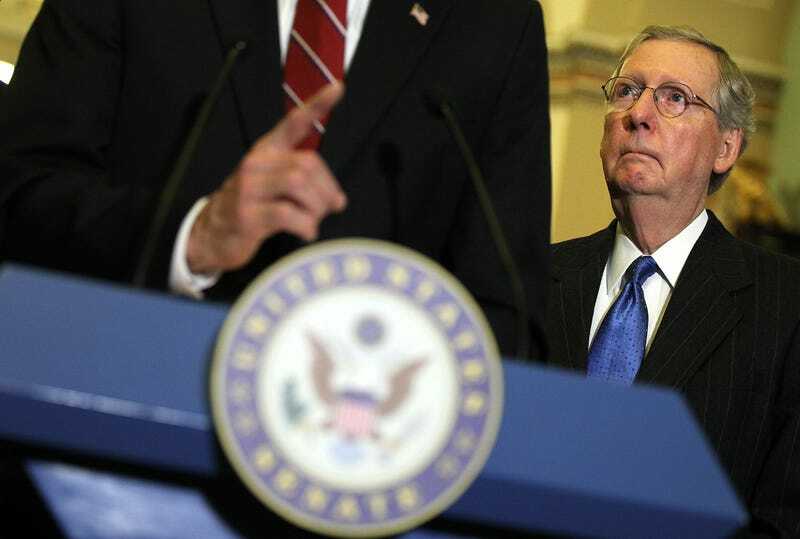 Politicians rarely fare well on social media when appearing on screen during sporting events, but this time the reaction from the digital crowd was less overt, horrifying racism and more one of University of Kentucky partisanship and suggesting that Mitch McConnell looks like a turtle. Fun! If these results are any indication, CBS pretty much screwed McConnell for the next midterm election. If Kentucky had won? It's probably all gravy. Instead, McConnell will have a fierce fight coming up against Ashley Judd, who has never wavered in her support of #BigBlueNation. As it happens, McConnell plans ahead for these things.